The DR 15 pressure differential pressure valve has a proportional control characteristic, opening with rising differential pressure. It is suitable for installation in circulated pumped radiator circuits equipped with radiator thermostatic valves. 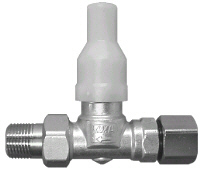 Design: flow regulation with cap for concealed setting. 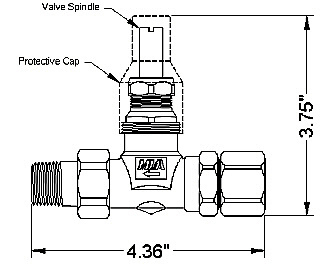 At a given setting (number of turns “n”) of the valve spindle and a given differential pressure, a given amount of water flows through the valve. If the differential pressure rises, e.g. when one or more radiators are shut off, the through-flow rate increases, relieving the pump pressure on the remaining valves. Two pressure ranges available: 0-2.9 PSI and 0-8.7 PSI. Regulates pressure changes in single and double pipe systems due to thermostatic radiator valve settings. Eliminates rushing noise and chattering in radiator thermostatic valves. DR 15 valve installed in central heating system with 3- or 4-way shunt valve. Turn the valve spindle (see fig.) until it is wide open. 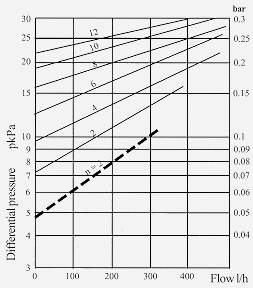 Locate the maximum differential pressure of the pump on the vertical axis of the graph and draw a horizontal line to intersect the “n” line corresponding to the required flow rate according to the horizontal axis. Then turn the valve spindle clockwise the number of turns indicated by the selected “n” line. The DR 15 pressure relief valve is delivered with a spring for a differential pressure range of 0-2.9 PSI in place. To alter the range to 0-8.7 PSI, exchange the spring in the valve for the separate one delivered with it. 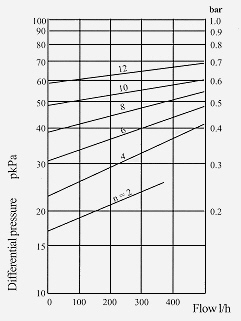 Spring for 0-0.2 bar (0-20kPa) pressure range. KiloPASCALS – kPa x 0.1450 = pounds force per sq. inch. BARS – bar x 14.504 = pounds force per sq. inch. 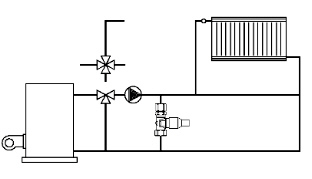 Spring for 0.1-0.6 bar (10-60kPA) pressure range. Compression fittings must be ordered separately.